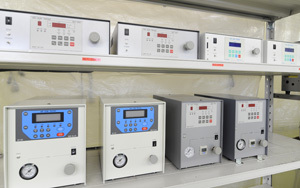 As a specialist in the manufacture and development of leak testing devices (leak tester, leak detector) and other industrial measurement devices, couplers and power saving & automation devices, NAKK has contributed greatly to the quality control and improvement programs of various industries for more than fifty five decades. We develop high-quality leak tester by ourselves in our own facility. We are unlike other major enterprises that are not able to provide flexible services since they are just retailers and distributors. What’s more, we can design and create any sort of leak testing device as well as leaks tests that are based on your specific requirements and needs. Another advantage of developing our products themselves is that we are able to achieve a much faster rate of production and turnover of products with a much lower cost. To know more about what we can do for your company, please do not hesitate to give us a call and we’ll be happy to discuss a customized plan that works for you. One of the things that make NAKK one of the best choices for leak testing devices is our highly trained and knowledgeable customer support group. Unlike other organizations that rely on outsourced customer support ? which are prone to misinformation or lack of knowledge to properly address concerns ? we handle everything in-house, guaranteeing that all your inquiries will be adequately answered. At NAKK, we also take pride in developing much of the technology we use, such as a new leak testing method called the Work Comparison Secondary Measurement Method (patented which is used to resolve problems in traditional leak testers. This new method allows stable inspection because just like “Work Comparison Method”, temperature and bulk changes occurred rarely. Also, the problem in “Work Comparison Method” where pressure difference can not be identified when both works has a leak. Sealing jig is essential to the automation of leakage inspection. Leakage can not be measured with high sensitivity without sealing and measuring method. We can design and produce jigs according to your work. You can choose the appropriate type of device according to your requirements. Its highly-sensitive sensor and specially-designed piping system make leakage inspection ultra-sensitive and fast. It is compact in size that saves space and makes it easy to incorporate into automated machines. It allows the user to freely sets the standard for test pressure, test duration and leakage determination. Its capability of displaying the level of leakage on indicating device allows user to easily determine the amount of leakage through the use of conversion or tables/graphs. Since Leak Tester has input and output outlets that allow connection with external devices to receive activation signal and send signals to tells the rejects/non-rejects and the completion of inspection, it can easily be connected to automatic feeding jig and automatic segregation device to be incorporated into mass production line as fully-automated machine. While inspection Is conducted using Leak Tester (leakage inspection), there may be a case when accurate measurement can not be achieved due to noise. “Difference in temperature” and “Change in volume” are some of the factors that may generate major physical noise. In case of work that is thin, wide surface area and higher heat conductivity, the pressure inside the pressure difference sensor changes due to the occurrence of volume changes caused by the difference in temperature. The volume increases as temperature rises while the volume decreases as temperature decreases and therefore, the change of pressure can not be detected correctly. Works that are prone to noise that is generated by the difference in temperature: Pipe, aluminum, radiator, etc. Some works expand or contract when pressure was applied into them for inspection. In such case, leak tester is unable to detect the correct pressure change due to change in volume. Works that are prone to noise that is generated by the difference in volume: Pet bottle, container made of resin, flexible hose, etc. Such noises can not be avoided by the old Pressure Difference-Type Leak Tester (leakage inspection). Also, even if “Work Comparison Method” is used to avoid the change in temperature, there is still a problem where pressure difference can not be identified when both works has a leak. In order to resolve the problems in the old version of leak tester (leakage inspection), NAKK has developed a leak tester (leakage inspection) that adopts the new method called “Work Comparison Secondary Measurement Method”. Since it measures the same works using “Work Comparison Method”, the effects from change in temperature and volume are very minimal and therefore, stable inspection can be performed. Problem in “Work Comparison Method”, which the pressure difference can not be identified when both works has a leak, has also been resolved by the implementation of secondary measurement. 4.Air pressure and hydraulic cylinder and hydraulic unit, etc.